But if we are to have more than this, it will be because our new public for High Culture becomes conscious of itself and begins to show some esprit de corps, insisting on higher standards and setting itself off — joyously, implacably — from most of its fellow citizens, not only from the Masscult depths but also from the agreeable ooze of the Midcult swamp. Thus, as soon as genre announces itself, one must respect a norm, one must not cross a line of demarcation, one must not risk impurity, anomaly or monstrosity. 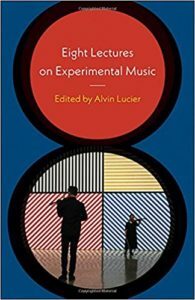 Between 1989 and 2000, sound artist, composer, and Wesleyan University professor Alvin Lucier invited eight composers whose work he taught in “Music 109, Introduction to Experimental Music” to speak at Wesleyan. In his Introduction, Lucier notes that these speakers have been paid for these talks via a discretionary fund at his disposal as the John Spencer Camp Professor of Music at Wesleyan. He also mentions that each lecture was “recorded and transcribed by a Music Department graduate student, then lightly edited by me . . . then sent to the composer for acceptance, verification, corrections, and additions.” These rather mundane details of the pecuniary and compositional harken to the most striking insights of Eight Lectures on Experimental Music: the fundamental necessity of the university labor hierarchy to foster these creative processes, the inclusive and cloistered networks through which this music lives, and the generational moment these composers and performers anachronously inhabit during the decade in which they give these talks. While by and large, much of the content collected here reads as unremarkable (and at worst irrelevant), brief tangents and stray observations elucidate the contours of a transitory period of American high cultural expression, one wherein the meaning (and sounds) of the genre of experimental music had always already melted into air. John Cage, however, describes it as music in which the outcome is uncertain. Works using chance operations or open forms or that set in motion procedures that are neutral in intent may be good examples of the experimental. Some works even resemble experiments in the scientific sense, in that something is discovered during the course of the performance rather than that a preconceived idea or form is brought into being by the will or skill of the composer. If art music continues, maybe the only distinction will be that people doing art music might design worlds that somehow are more specialized or exotic or even have watermarks . . . You might make it for one or two people, or one museum, where it would be theirs in this perfect way. It doesn’t have to get played in a million restaurants and bookstores, like poor Bach or Mozart. In this imagined scenario, the experimental can only continue to exist through a resistance to the public sphere, not via a revanchist countermove but rather through fortifying its retreat. These “watermarks,” little more than a personalized branding, does not avoid commodification as such but rather insists upon a particular mode of commodification, an elite form so removed from the masses as to warrant a personalized key code that only a few possess. One need not wonder for too long as to who these lucky listeners would be, quite obviously those with enough disposable income to pay the artist enough for the composition to be worth their time. This rather dystopian form of availability points towards a revitalization of hierarchy in which High Culture could once again carve out its own exclusive niche, not by virtue of its stylistic idiosyncrasies but rather its utter scarcity in the marketplace. As minimalist visionary La Monte Young tellingly remarks during his talk, “It’s difficult being a composer who earns his living through his work to ever get caught up on money; it’s a very difficult situation.” Perhaps a materialist account of experimentalism as genre would track precisely how this living was made and its changes over time, the access to funding chains that can sustain a specifically and intentionally unpopular music. Instead, Young’s talk moves between the highly technical (“But the C-sharp could only play alone, or with the D, or with the D and the C, or with the D and the C and the G. The C-sharp could not play alone with the G, it could not play alone with the C, and it could not play with the C and G without the D.”) and the absurd (“For instance, some of you may know that Marian and I live on a very special rotating sleeping-waking cycle. Currently we’re usually awake for about twenty hours and then we sleep for about ten hours. And this goes around, all the time it’s going around.”). Young does indicate the ways in which this music’s sustainability and proliferation relies upon outside politico-economic structures: “During the recession that we had just in these last few years, you have a good example. There was very little support for the arts because people really needed the money to buy a quart of milk. And when push comes to shove, it’s basic survival. It’s true; you can’t eat a painting.” And while his comment appears directed towards the tightening belts of consumers (or more likely in this case, patrons), the same implications hold true for the composers of this work: the time to make this work must be purchased. If an artist refuses public spheres, the largesse of the private sphere must step in. And while this elite benefaction may help to undergird the lucky artist’s work, it certainly does not offer a hell of a lot of relief to this lost listener who cannot afford their dietary staples (grocery stores tend to pipe in Top 40 and Classic Rock rather than Young’s six and a half hour epic, “The Well-Tuned Piano”). The most fully realized and ardently composed talk in Eight Lectures on Experimental Music comes from the radical composer Christian Wolff, who at the outset seeks to answer “What is our work?.” Through a discussion of “material survival” that “obviously depends on social networks,” Wolff also acknowledges a tension between “an economy geared to mass consumption on the one hand, and therefore to a homogenizing of our cultural experience, and, on the other hand, an economy that feeds on a privatizing technology.” He usefully frames the experimental as a “sliding notion,” a theoretical marker that strikes me as akin to the “harmonic glissandi” James Tenney discusses in the formal analysis of his own work. Wolff cites Adorno as a guide for imaging this sliding, quoting his maxim that “‘the new [in art] is the longing for the new, not the new itself.’” Wolff’s Marxist account of experimental aesthetics fails to adequately draw out just what that affective possibility of longing may mean for the material reproduction of this genre. He slips into vagueness (“What is experimental? In some ways it is, as said before, a variable notion, differently realized at different times or by different works”) before finely slipping into a tautological definitional gesture (“So what is our work? It is, I believe, experimental music.”). Experimental music then strays just out of our grasp once again, diffusing into an uncertainty of what it means now, even if many of these lectures seem convinced that it surely once meant something. Wolff’s concluding obscurantism signposts precisely what makes this work so confounding and so useful. As the tenability of the experimental became ever harder to discern, one begins to see (and hear) with increasing clarity just how ethereal it was from its inception. Lucier’s famed 1969 piece I am sitting in a room, a deteriorating tape loop of speech that eventually dissolves into the resonant frequencies of the room he performed it in, mirrors this collection itself, less about the content of what has been said and far more about the larger, structural containers of its utterance. Clint Williamson is a PhD Candidate in English at the University of Pennsylvania.